The beautiful island of Skyros, part of the Sporades islands, is truely a magical place. It is a small island located between the island of Evia and the islands of the North Sporades. Skyros has a lovely selection of beautiful towns and coastal resorts, and is the ideal destination for those who are seeking a holiday destination away from the crowds of some of the more commercial and touristic islands. 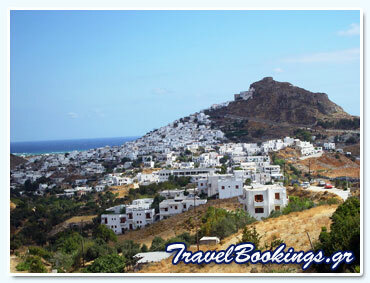 Skyros is a very traditional island, and one that has maintained its unique beauty and charm throughout the years. From the famous Skyrian Ponies, to the beautiful monasteries and churches, Skyros has much to offer visitors. There are some wonderful beaches found all around the island, making it a perfect destination during the hot summer months. Visitors to the island can easily venture off and explore the island and find an entire secluded beach to themselves. Skyros has some very impressive and interesting musuems that are well worth visiting, and which offer a great insight into the historical and cultural importance of the island. Skyros has an airport that caters for charter flights during the summer season, as well as a ferry connection with Kimi on the island of Evia. Below you will find information about the current accommodation and hotels that we have available on the island of Skyros in the Sporades Islands in Greece. For more information about the accommodation or hotel, or to check availability and rates, simply click on the corresponding button.